All in-stock items ship within 24 hours Monday through Friday. If you need your order sooner, call us at 800-648-1163 or email us at service@bulbman.com. 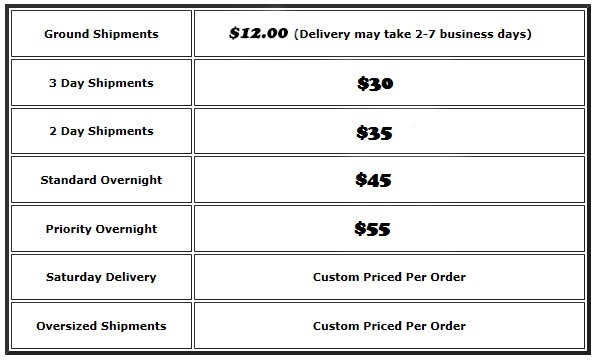 We are more than happy to use your company's shipping account to minimize shipping cost. Just write the account number in the customer comment field when ordering. Bulbman guarantees all lamps regardless of the manufacturer. If you are not completely satisfied, we will give you a replacement lamp or credit your account within 30 days of you receiving your product. Fluorescent tubes have no guarantee from damage in shipping due to how fragile they are. We will contact you if a freight variance occurs prior to shipping the product(s) out. Special shipping or handling charges will apply for over sized or heavy packages. Re-pack charges will occur for fluorescent lamps shipped in quantities less than full case. Also, due to their fragile nature fluorescent tubes have no guarantee from damage. We highly recommend picking them up from one of our stores instead of shipping. Fixtures ship at actual freight cost that will be calculated at time of shipment. Our site is currently unable to calculate international shipping rates so we are unable to process international orders online. If you would like to place an order for delivery outside of the United States please call us at 775-788-5661. All orders are shipped via Bulbman's "preferred carrier" unless noted on the order form. Your tracking number will be available to you upon shipment by logging into the My Account section of this web site. Returned product must be in the original packaging and in sellable condition. ie no retail pricing stickers, markings etc.